10 CC are nothing short of astounding, I’ve written at length regarding their muscis and the band previously ... let me suffice to say that this is a brilliant release, "Deceptive Bends" is every bit as lyrically cleaver and demanding musically as anything they have done in the past. When this album came out it was on my turntable all of the time. The music strikes chord deep inside that let me feel as if this album had always been playing in the background of my life, it was only when I was able to hold the record jacket in my hands that I was able to realize this. Though through the years I’ve narrowed the scope of the album to about six of the stellar songs, that decision in no way diminishes the strength and timeless fell you will find in these songs. When this album came out I couldn't play it enough. It was the freshest piece of material I'd heard in years, they have arrived with this release. Buy the CD, not the greatest hits for this one, it needs to be played as a conceptual piece. Of primary importance is the song ‘Mandy’, a fresh trippy adventure “Down The Rabbit Hole,” or as in this song, “Into The Poster.” It involves a guy eyeing a travel advertisement poster, and starring out at him is an airline stewardess, with a “fly with me smile”, flanked by an image of a huge silver plane. And before he knows it, he’s in the poster and on the plane...the plane is flying over the ocean, Mandy is the most perfect beautiful woman he’s ever encountered, she’s serving his every airline need, and he’s fallen head over heals in love with her. But then, as in life, tragedy strikes, driving us all to self preservation; all that is except for Mandy, who does what all perfect beautiful stewardesses do...she saves this guy and the passengers as the plane plunges into the ocean, and then she fends off the sharks before she forever goes under. When our gent snaps too, he’s standing in front of the travel poster as he was at the beginning of the song, only now he’s soaking wet with salt water, trying to tell his friends about his adventure and how the woman from the poster had saved his life. His friends shake their heads telling him it’s all a dream, but he knows better, IT WAS REAL. He had found true love and lost it all in an instant, what a perfect metaphor for life by this wonderful group, 10cc. 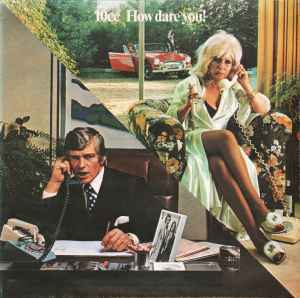 This won’t be the last surprise on this record, the only surprise is whatever happened to 10cc, who seem to have disappeared as mysteriously as Mandy. 10cc set out to make perfection and on this release have achieved it, ‘Art For Art Sake’ are nothing less then a master pieces of fine guitar work, interwoven stories, a great back beat and a simple bass to take you away crisply and cleanly. It was a fine retreat from the heavy metal of Led Zeppelin, Linyard Skinyard and such that were dominating the airwaves at the time. "How dare you!" was the first _complete_ album I ever bought in my life. In 1976 I only had a cassette player and I had to order the cassette version. Nevertheless this one was played in the morning and in the evening. Still my favourite 10cc album. But what is it? It's not just "Soft Pop", it's advanced pop music with an very intelligent approach. Not sophisticated (like "The Original Soundtrack"), but complex, and mostly easy-minded at the same time. Nice pop melodies mixes up with some kind of overwhelming drama ("I'm Mandy Fly Me"), irritating funk grooves were interrupted by lots of voices ("I Wanna Rule The World", "Art For Art's Sake"), BeBop-like notes goes Pop ("Iceberg") and lots of more ideas. Every song seems to be some kind of a little head movie. Timeless. Anyway, the only song I don't like is "Rock n Roll Lullaby".